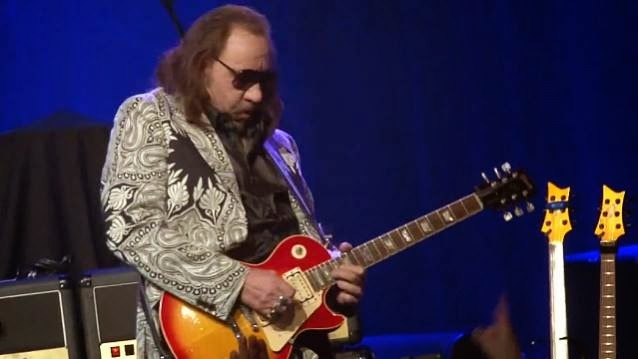 Original KISS guitarist Ace Frehley will play his first run of U.S. shows in a couple of years at the end of November. Ace's short batch of dates will include two back-to-back concerts at B.B. King Blues Club & Grill in New York City on November 24 and November 25. Tickets for the NYC shows, which will be presented by VH1 Classic "That Metal Show" co-host and radio personality Eddie Trunk, will go on sale on Wednesday, September 24. Frehley's touring lineup will include none other than Richie Scarlet, who rode shotgun performing rhythm guitar and vocal duties on Ace's "Trouble Walking" platter in 1989, and will do so again on stage. Richie toured with Ace in 1984 and 1985 and periodically from 1989 through 1995 and was also known for touring with Sebastian Bach. On bass and vocals will be Chris Wyse from Queens, New York. Previously recording with Ozzy Osbourne and playing on Mick Jagger's 2001 solo album, Chris is well known as the bass player from THE CULT since 2006. Chris can also be heard on Frehley's new album, "Space Invader", on select tracks. He also covers bass duties in his current band OWL. Finally, Scot Coogan will be behind the drum kit for Frehley's upcoming tour. Coogan played with Frehley for five years until 2012 when he left Ace's band to focus on other projects. He has since toured and recorded with LYNCH MOB and sat behind the kit for Lita Ford on the 2012 "Rock Of Ages" tour with DEF LEPPARD and POISON. "I consider Ace a friend, and I will always be his drummer," Scot said. "When he called me about doing shows, I was honored. We are both excited to have the chance to play together once again." Coogan recently completed work on the debut album from RED ZONE RIDER, a three-piece band also featuring world-class guitar hero Vinnie Moore (UFO) and vocalist and multi-instrumentalist Kelly Keeling. RED ZONE RIDER's self-titled CD was made available on September 16 via Magna Carta. Says Frehley: "I can't wait to hit the road again with this new lineup. I'll be performing Ace classics as well as songs off my new CD, 'Space Invader', for the enjoyment of the fans. Let there be rock!" Matt Starr, the featured drummer on "Space Invader", will spend the next few months touring with MR. BIG as the replacement for Pat Torpey, who has been diagnosed with Parkinson's disease. "Space Invader", the first new solo album from Frehley in five years, sold around 19,000 copies in the United States in its first week of release to land at position No. 9 on The Billboard 200 chart. The CD arrived in stores on August 19 via Entertainment One Music (eOne Music). Ace's previous CD, "Anomaly", opened with around 17,000 units back in September 2009 to debut at No. 27. "Space Invader", which was made available in Europe on August 18 (three days earlier in Germany and Scandinavia) through SPV/Steamhammer, includes 11 brand new original songs as well as a cover of Steve Miller's "The Joker".